Manti Te’o will talk about his misadventures in cyber love to Katie Couric Thursday on her daytime talk show. 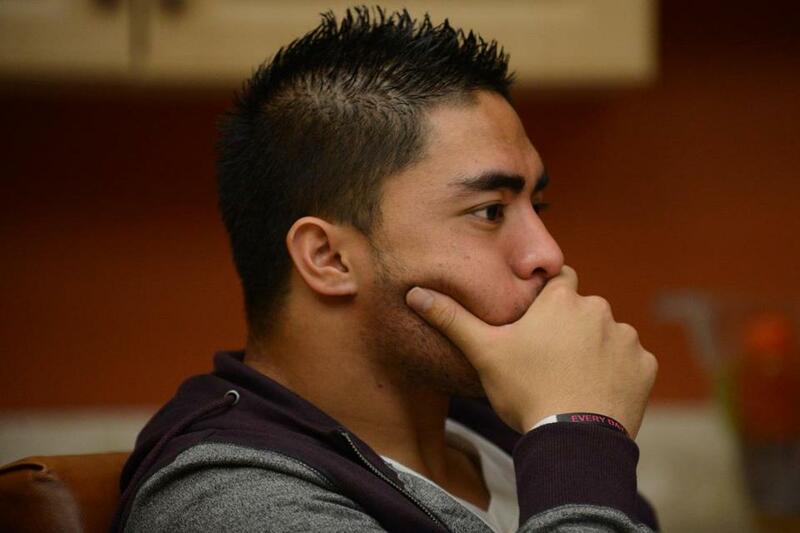 Heartbreak or hoax, the story of Notre Dame linebacker Manti Te’o and his fabricated girlfriend has become a national head-scratcher. But the idea of making up a story, or believing a lie, in the name of love has deep roots in popular culture. We’ve been carrying on relationships — and misrepresenting ourselves — long before the tattoo sleeves worn by Te’o came into vogue. From Cyrano de Bergerac to the MTV show “Catfish,” romantic con games are as old as cupid’s bow and arrows. “To some extent, there’s a real old-fashioned, traditional, romantic element in the idea of just having an exchange based on emotions and words,” says Nev Schulman, the host and executive producer of “Catfish: The TV Show.” He was the victim of an online dating hoax himself, which he documented on film. Now he is helping others in the same spot. Plenty of cyber relationships manage to blossom without a face-to-face meeting. Te’o, whose story of loving a terminally ill young woman who, he says, existed only in cyberspace has become a national fascination, will talk about his misadventures in cyber love to Katie Couric Thursday on her daytime talk show. But regardless of what he says, those who study the Web say there is nothing new in Te’o’s story of what happens when a couple dates strictly through text messages, Facebook, Twitter, or e-mail. Long before 1990s Internet chat rooms provided a cloak of invisibility for the amorous to falsely present themselves as a prince charming on white steed, or a chaste Midwestern maiden, there were pen pals. Even beloved pessimist Charlie Brown was duped into love by a pen pal in the comic strip “Peanuts.” Think of him as the proto-Te’o. Schulman, the “Catfish” producer, compares the Internet love scams of today to the braggadocio found in love letters of long ago, or even the 17th-century French dramatist Cyrano de Bergerac hiding behind a surrogate to win the hand of Roxane. Not much has changed since those gushing missives of yore, says Julie Spira, the author of “The Perils of Cyber-Dating: Confessions of a Hopeful Romantic Looking for Love Online.” It is the means of communication that has changed. She’s coined a term for it: Digital Pen Pal Syndrome. When in high school, Spira traded letters with foreign pen pals. These pencil and paper friends felt very real to her, she says, despite the fact that they never came face to face. MIT’s Turkle, who studies how technology plays a role in our interpersonal relationships, says there is also a desire among romance-seekers for exclusively online relationships. These specialists point out that most people using online dating websites such as Match.com, eHarmony, or OKCupid are usually looking for a serious, real-life relationship. The expectation of these sites is that you will connect online, and then meet for a date. According to Schulman, finding true love can be dicier through social media sites such as Facebook, Twitter, or Instagram. It may seem impossible to enter into a serious online relationship in 2013 without the aid of video chatting, but Schulman said in his case he was so smitten that he ignored the warning signs. Which is why Adam Lo­Dolce, a Boston-based “dating confidence coach,” adamantly advises his clients to meet people the old-fashioned way: Approach them and say hello.